I stopped adding to this blog in 2014 when I gave up teaching to return to the UK to care for my Mum. At the time, I thought it was going to be a temporary absence from the classroom. As I write this in 2017, however, it feels more permanent, so I have decided to archive this blog. I've deleted all the non-teaching related posts and will leave those that remain as a reference for interested parties. 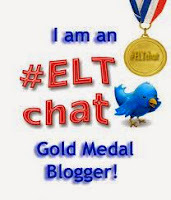 Welcome to the 38th ELT Blog Carnival and the first of 2014. As is wholly appropriate as we begin the new year, our theme is 'Resolutions'. I'd like to thank all the participants in this carnival and all the terrific members of my PLN who spread the news about it on Facebook, Twitter, etc. Please enjoy all the great posts! Lizzie is such an inspirational member of my PLN and I wasn't at all surprised when she was the first to send me an entry for this carnival. She had an amazing year and I'm sure 2014 will be equally exciting. Read her post here. This post from the amazingly supportive Vicky Loras has some timely advice for new teachers as we enter the new year. We have two contributions from Eva. The first is a post first published in January 2012, entitled 'New Year, New Beginnings', which outlines a great lesson plan to use with students in one of your first lessons of 2014. The second is a description of five tech tools that Eva intends to use with her classes in the new year. Read it here. Ellen gives us a link to a New Year resolutions generator which we can use with our students. Find it here. Here, David urges us all to make teaching resolutions as part of our own professional development. For 2014, his pledge is to 'make it real'. We also have this post from David, via EFL Teaching Recipes, describing a lesson plan on New Year's Resolutions. Sharon shares a great lesson plan based on New Year resolutions. Read all about it here. Jennifer gives us 'Five resolutions to modernize your teaching in 2014'. There are some really good ideas here which should give us all pause for thought. In this post, Larry tells us about the best ways to help make your new year’s resolutions succeed. So, that's it! I hope you enjoy reading the posts and please make sure you check out the next carnival which is being hosted by Anita Jankovic on her blog. Some readers may wonder how I can host a carnival and have no contributions of my own. I assure you my intention was always to have a couple of posts, but, unfortunately, since flying to the UK on New Year's Eve, I have had some serious family issues to deal with and have had no time to write. I wanted to publish the carnival on time and hope to be able to add my posts later. 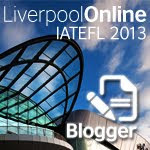 I am an EFL teacher and traveller, currently taking a break from teaching to see more of this wonderful world of ours. Together with my husband, Mark, I try to enjoy every single day.